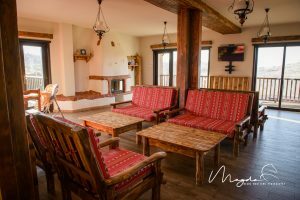 I found out about the Potcoava equestrian center by chance, when I was looking for locations for my monthly horse photography workshops. I had read all the information on their website, but nothing had prepared me for what I was about to find there. The road is winding and full of pits. From the Brebu village, near the Leaota mountains, civilization ends and hills begin. Pastoral landscape, as if in an Alecsandri poem. A narrow, modern road, a few kilo meters long, starts from there. A miniature Trans-Alpina. It is the access road to Potcoava, located in the middle of wilderness. Sensor-activated entrance barrier, with video camera. Rectangular manege, round pen manege. 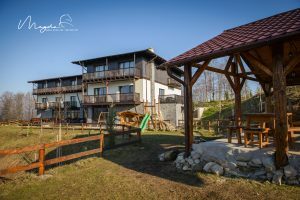 Wooden cottage with grass roof for kids. Pavilion, stable and fences made from the same wood. 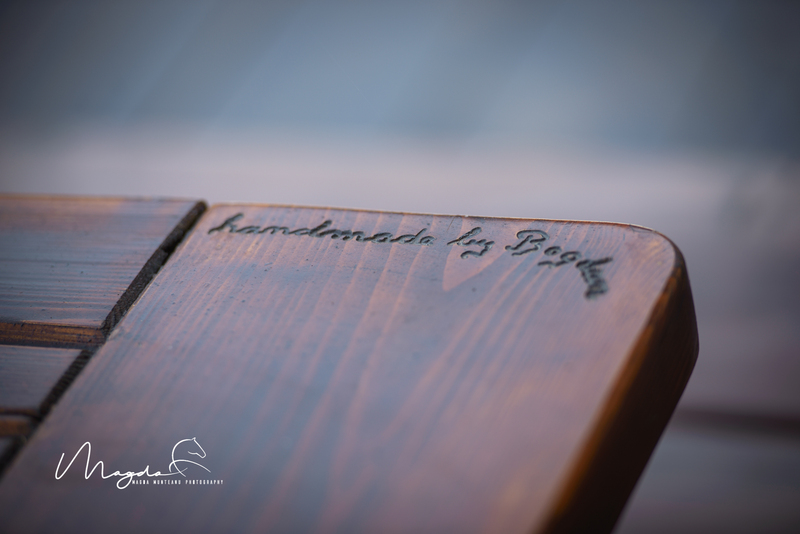 Tables and chairs handcrafted by an artist from Timisoara. 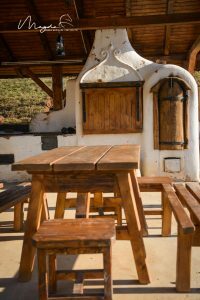 Fireplace and wood ovens created by a ceramist artist from Covasna. Everything feels high-class here. I haven’t even entered the guest house yet. I simply stand still and look around. The Leaota mountain summits lay in the background, covered in snow. Flowers and dandelions at my feet. I hear a neigh. 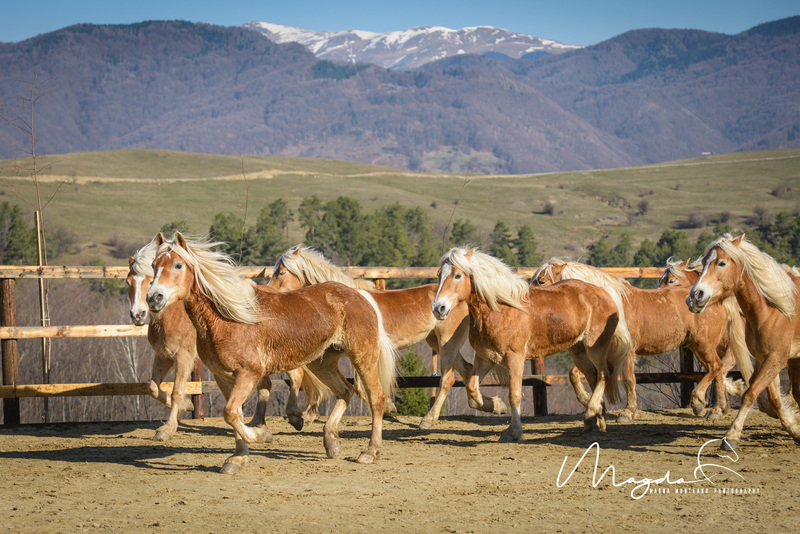 12 blonde Haflinger horses graze relaxed on the 5-hectare land of the center. “In 2008 I got sick of horses. I’ve searched for land to buy for half a year. 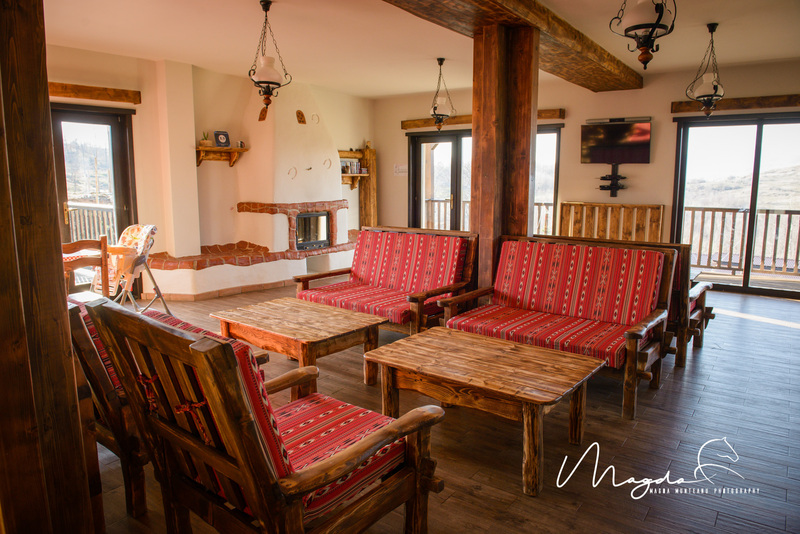 When I arrived here, I found the place in 15 minutes,” says Ionut Popescu. He is a cheerful man who, at a first glance, looks like Gyuri Pascu. Then you notice the kindness in his look a nd attitude whenever he talks about horses or is around them. 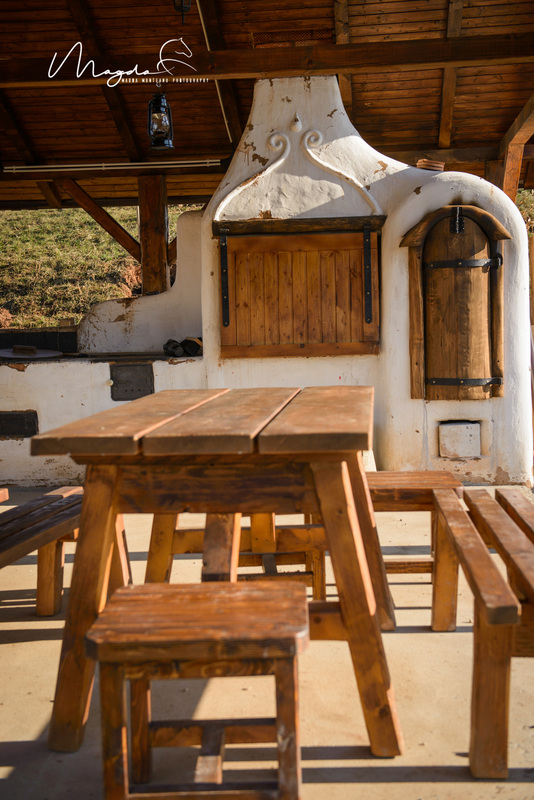 He didn’t know anything about horses until he decided to build his own equestrian center. He used to work in the software sales sector. It took him one year to decide what kind of breed he wanted. 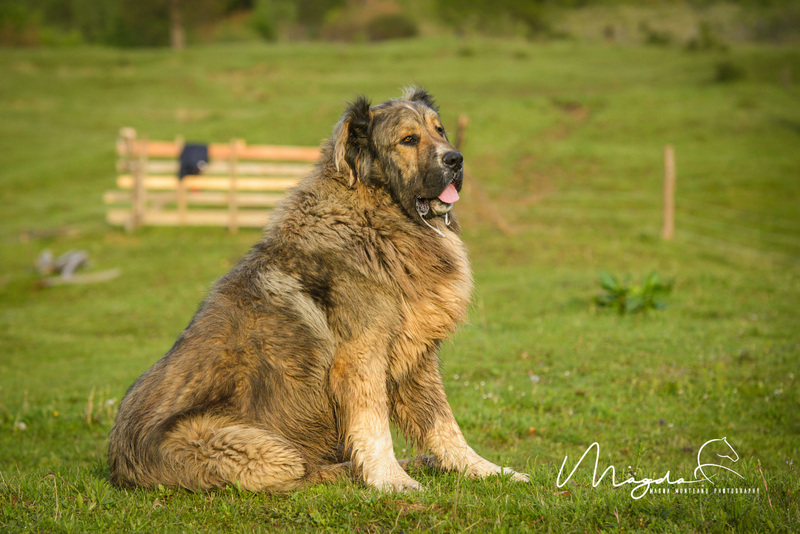 He visited many stud farms and studied many breeds. Nothing fit his wishes. 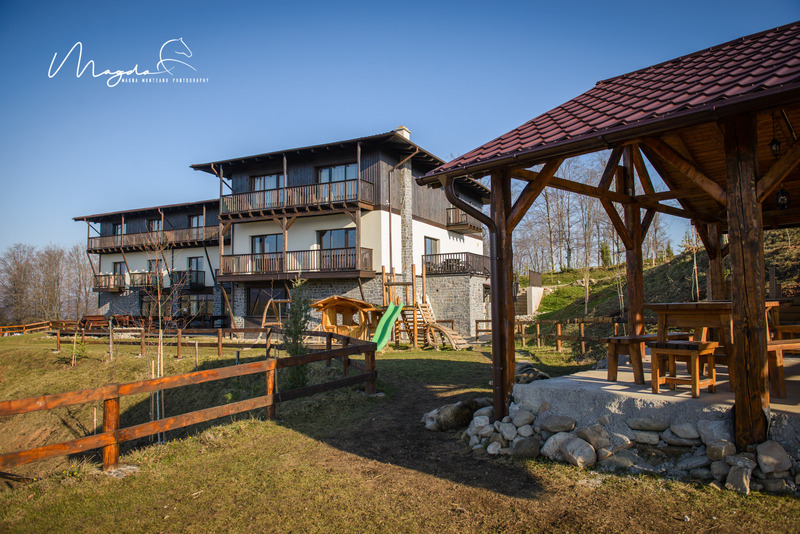 He wanted Huţul, which is a Romanian type of horse that can be found at the state-owned Lucina stud farm. “You could say it is a kind of goat if you see how it climbs mountains. But we needed beautiful horses. The Huţul is small and quite ugly,” says Ionut. He definitely needed to learn more about equine psychology and riding. 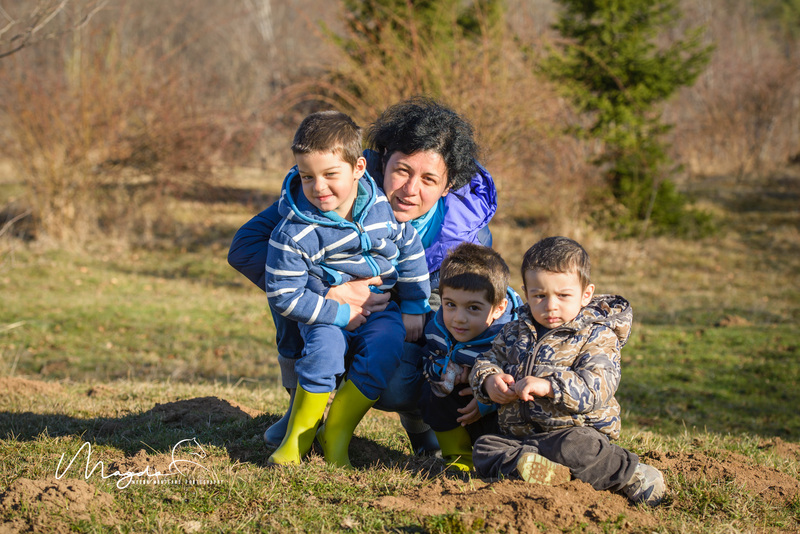 So that Silvia, his then girlfriend, with whom he has three kids now, made him a surprise. 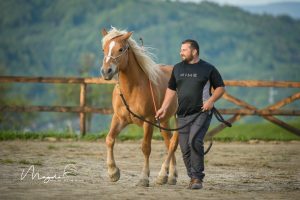 He arranged for him to go to Spain, to a “doma en liberdad” (training at liberty) course with the well-known Romanian horse trainer Miron Bococi. He stayed there for two weeks. Horses had come to listen to him so well that he started to suspect Miron had given him already trained horses. One day it happened he had the chance to apply what he had learned in a real life situation. The Barcelona police called to let them know that a wounded and violent stud had escaped in a nearby field. Miron said that was his test. He caught the horse with a lasso for him and led it into the paddock. 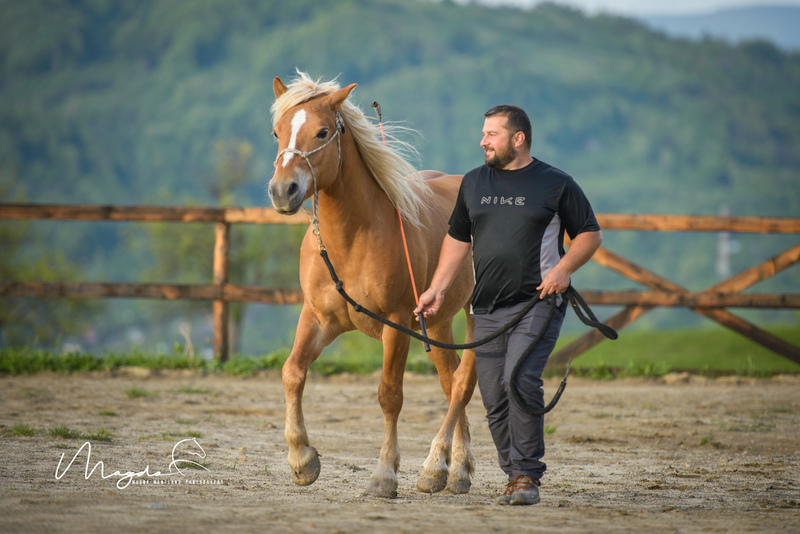 Ionut had only a leash and a horsewhip. “In 45 minute, that stud that had wa nted to kill me before stood still and let me clean his wound. 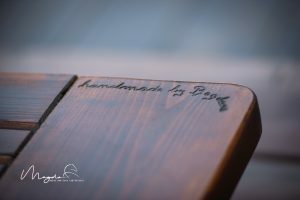 It was incredible,” says Ionut. Everything went smoother from then on. 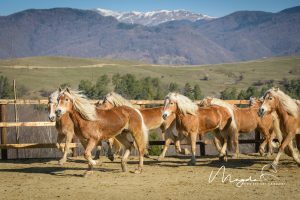 He decided to buy Haflinger horses, which are a relatively small, mountain breed that lives at altitudes higher than 2,000 meters. Their legs are adapted to the rough terrain and they have a small part of Arab blood in them. They are gentle but, if you know how to ride, their Arab part becomes immediately visible. 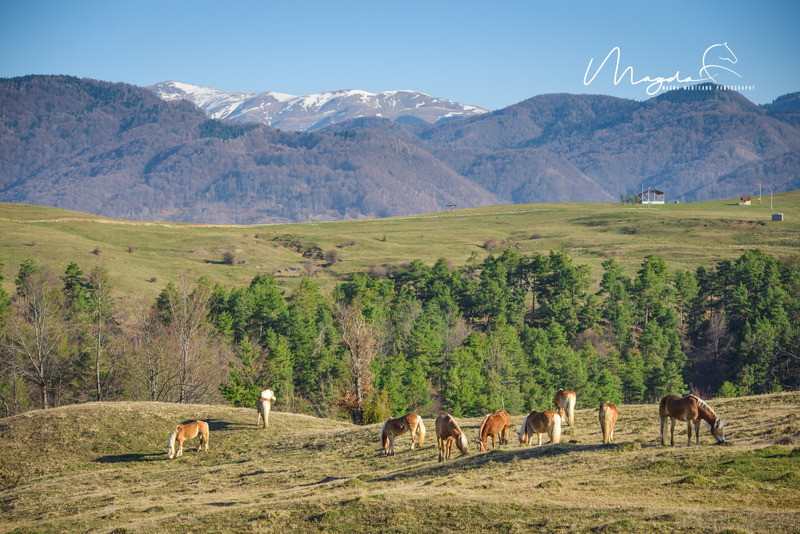 “When he heard what I wanted to buy, Dan Mosescu from 7Cai told me I’d better buy donkeys,” reminds Ionut smililng. He stuck by his plan. Together with Miron Bococi, he went to Northern Italy, in the South Tyrol area, in the Hafling village. 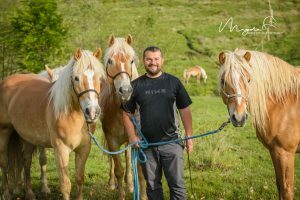 He bought 10 Haflinger horses which he brought to Romania and, with Miron’s help, trained them. 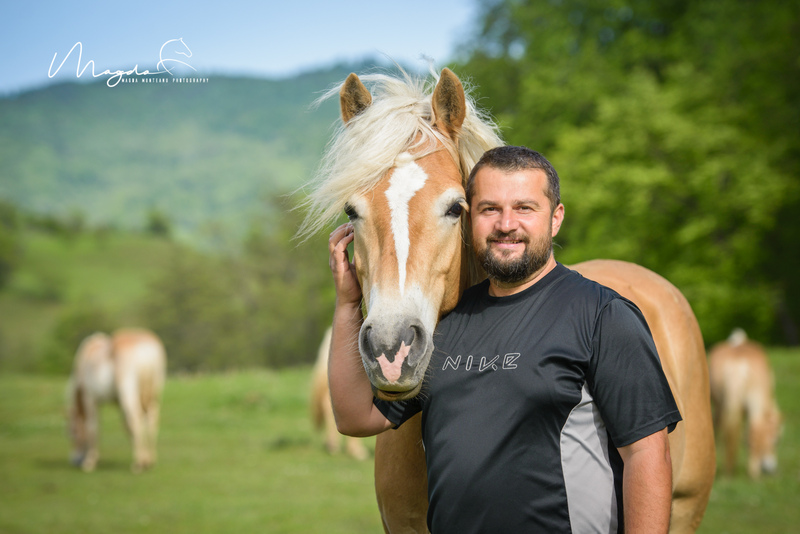 “I think that half of a horse’s value comes from its education,” says Ionut. His horses are now so gentle and loved that one cannot help but pet and kiss them. Every five days the grooms wash them with a special shampoo, which makes their manes even more shinning. The mares have had two foals meanwhile, which are now one year old. I put on my gear and go riding in the mountains with Mugurel, Ionut’s most trusted groom, to see the area where I was to take the people in my workshop for a horse ride. I ride Stewart, the dressage horse suitable even for children. I cannot resist the temptation to see how fast these gentle horses can be. We start galloping. Slower in the beginning, then faster. They love to run, that’s for sure. I feel safe, it’s a pleasure to run over the hills. Stewart feels completely different from Petru, my Arabian horse. His feet are shorter and he needs to run faster to reach the same speed, but it’s excellent. When I want to stop, the horse walks at pace relaxed. I feel safe again. It’s getting clearer that I’ve made a good choice for my workshop. Launch time. I cannot stop eating. In two days I’ve put on one kilo and a half. I fin d out the reason the food is so tasty: three MasterChefs from Bucharest had come to Potcoava to draft the menu and train the two local cooks. I feel the result of their work in my taste buds. I go out for a coffee in the wooden pavilion. The two enormous Caucasian dogs, Gora and Gonda, lay quietly at my legs. The wind blows the fluff of the dandelions into the air. A noisy woodpecker sits on a branch nearby. Two horses neigh. Positive energy. The next morning, at sunrise, I have a photo session with all 12 horses running free over the pastures.